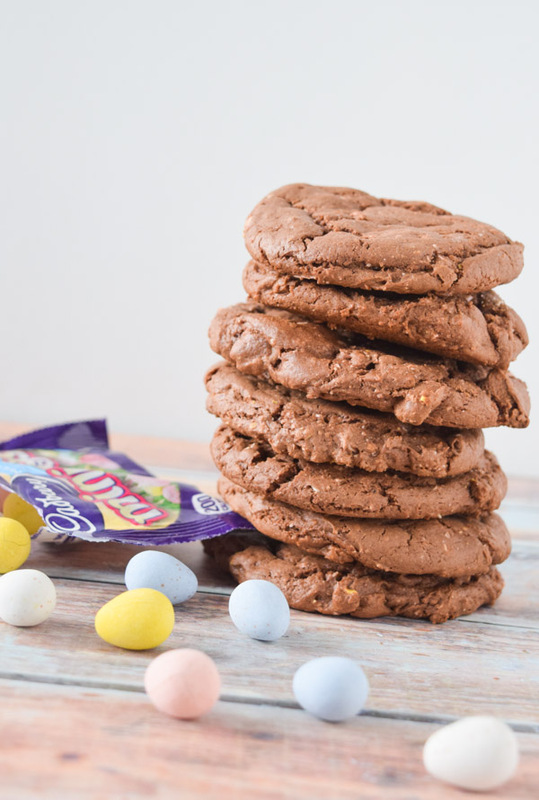 If you love Cadbury Mini Easter Eggs, you will love these easy Chocolate Cadbury Egg Cookies! A soft chocolate cookie with pieces of chocolate candy-it doesn’t get better! Okay, back to the cookies. 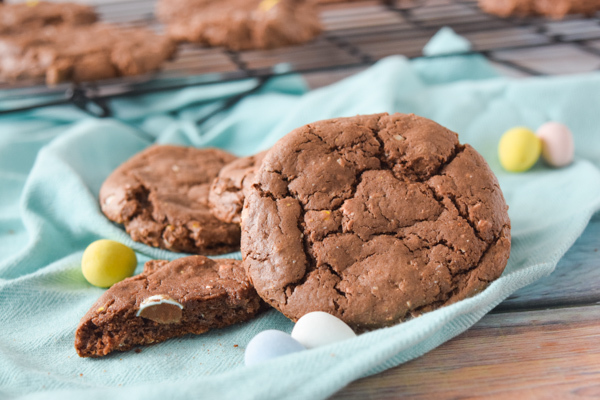 A couple of weeks ago, I wondered what would happen if I made up a batch of cookies using my favorite Easter candy. What could be better than combining candy with a cookie, right? The result are these delicious chocolate cookies. The Cadbury eggs adds another dimension of chocolate goodness along with a small amount of crunch. 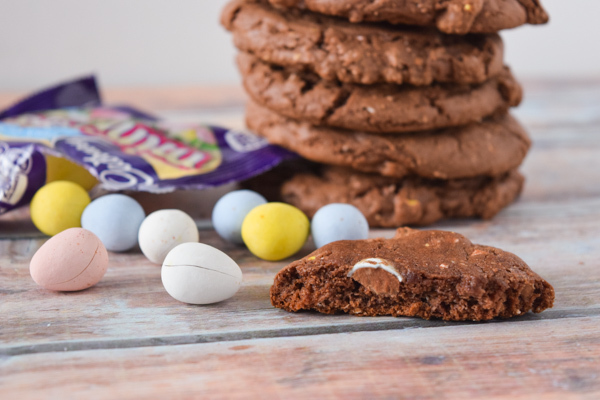 When you take a bite, you get the chocolate cookie but then it surprises you with another layer of chocolate from the Cadbury eggs! 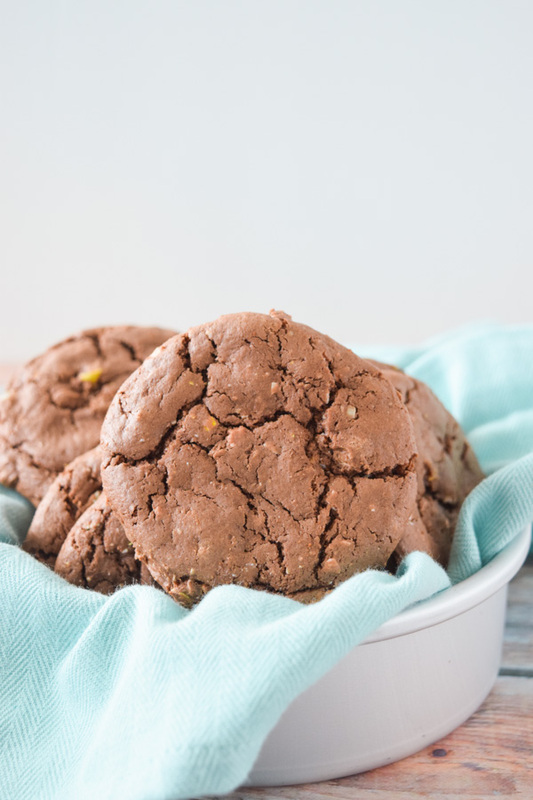 These cookies are really easy too because they use a chocolate cake mix. I used what I had on hand which happened to be a milk chocolate cake mix. But you could use Chocolate Fudge, Chocolate, Devil’s Food… whatever your favorite is. Throw in a couple of other ingredients along with the Cadbury Mini Eggs and you’re good to go! I crushed up one of the smaller bags of Cadbury Mini Eggs and used the entire thing. I put them in a baggie and went to town with my rolling pin. It was a good way to get rid of some frustration! My kids like doing it too. You could also use a food processor, especially if you’d like the pieces smaller. Personally, I like finding a chunk in my cookies. Like that one there… Yum! Remember when baking cookies that they finish baking on the pan when you remove them from the oven. The cookies should be a little soft out of the oven, otherwise they will harden and burn. Just keep your eyes on them! And don’t let them sit too long on the baking sheet. Also, another tip when baking cake mix cookies, flatten them down slightly before you bake them. They have a tendency to spread and get taller and flattening them helps. 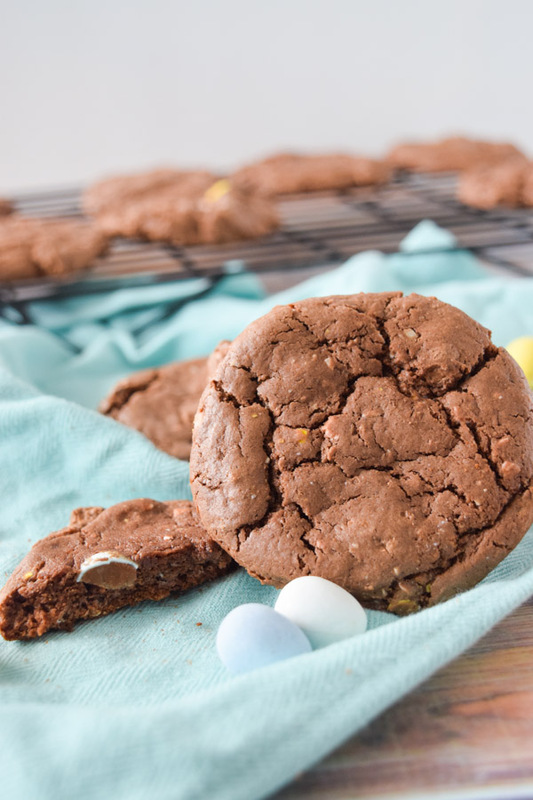 Chocolate Cadbury Easter Egg Cookies are soft, delicious, and packed with chocolate! Mix cake mix, eggs, vanilla, oil, and brown sugar until well combined. The batter will be sticky! Put your bag of Cadbury Mini Easter Eggs into a food processor and crush. You can also put them in a plastic baggie and crush them with a rolling pin. Add the crushed Cadbury Mini Easter Eggs into the batter and fold in. Place spoonfuls of cookie dough onto a greased cookie sheet about 2 inches apart. These cookies spread! Flatten the tops down with the palm of your hand or with the bottom of a glass to prevent the cookies from rising too tall.